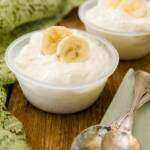 This banana pudding has a surprising secret ingredient that is as southern as banana pudding itself - grits! In a medium-sized mixing bowl, whisk together grits, butter, sugar, salt, cinnamon, nutmeg, and eggs. Stir in the vanilla and hot milk. Bake for thirty minutes or until the pudding just begins to set. Top baked pudding with a layer of banana slices. Reserve a few slices to place on top of the whipped topping. In a separate bowl, mix in cream cheese and sweetened condensed milk. Gently fold cream cheese mixture into whipped cream. Scoop whipped topping over banana layer. Top with a few extra banana slices. Refrigerate for at least an hour or until ready to serve.